Family cars and compact execs - 1 | What Car? It's hard to improve an already excellent car, so Volkswagen has decided on a two-stage upgrade and replacement plan. Stage one introduces the latest efficient Bluemotion technology into the existing Passat model (see below), but we're more interested here in stage two the all-new Passat. VW has taken an evolutionary approach with the car. 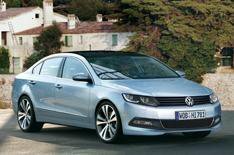 Gone is the old-style front grille the front end now has the look of the latest Golf, with a hint of new Polo. In profile, the car resembles the current Passat CC coupe. The new Passat Estate doesn't change the winning formula of the current model. Yes, it has the new front-end styling, but there's still the same practicality at the rear, with a large, regular-shaped load space. There will be a wide range engines to choose from, and the excellent DSG semi-auto gearbox will be available, too. Volkswagen's faithful family model, the Passat, is to receive the latest Bluemotion environmentally friendly technology while we are waiting for the arrival of the all-new car in 2010/11. This will drop CO2 emissions to 114g/km at a time when manufacturers are desperate to prove their green credentials to fleet companies and company car drivers. The Passat's Bluemotion 1.6-litre diesel engine is smooth, and the car has an official average of 64.2mpg. If there's one car that promises to make a cracking estate, it's the Skoda Superb. It's huge inside, well built and comfortable all at a super-competitive price. The Superb has an enormous 633 litres of boot space with the back seats up, or 1865 litres when they're down, which makes it seriously spacious. It's not all about the boot, though. Passengers have nothing to grumble about, having oodles of cabin space. Rear legroom is especially generous. There are six engines to choose from, but our money's on the 138bhp 2.0-litre diesel. It's got enough pull for the car to feel nippy, yet has a lower price and lower running costs than the 168bhp 2.0 model. Skoda's reputation for reliability and customer satisfaction comes as standard. The 320d ED looks like a standard 3 Series and even drives like one. However, the boffins at BMW have made the car ultra-efficient, so it's capable of 68.9mpg. A retuned engine, lower ride height, longer gearing and special aerodynamic wheels fitted with energy-saving tyres all help this saloon to emit just 109g/km of C02. This means the 320d Efficient Dynamics saloon falls into the lowest category for company car tax, and also costs just 35 a year in road tax. The engine produces less power than the standard 320d's, but in revised form and with new gearing it is far smoother at lower revs, so owners won't use as much fuel at the same speed. The car also has an engine stop-start system, brake energy regeneration and more efficient electric (rather than hydraulic) power steering. Renault has a hat-trick of electric cars planned for the showrooms, but the first we'll get to drive is the Fluence. Fluence was the name on Renault's 2004 concept car that became the Laguna Coupe. The new Fluence is a more sedate saloon. Its 'Quickswap' lithium-ion battery pack could change the way we think about running cars it's located under the vehicle where a fuel tank usually sits, and can be swapped in three minutes at dedicated Renault service centres. Each swap gives the car another 100 miles of range, allowing owners to go for longer without having to stop and charge up. The Fluence is based on the latest Renault Megane and will take a family of four with ease. The electric motor produces 95bhp, giving it acceptable A-road performance.